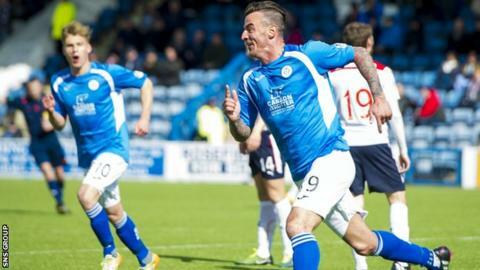 Queen of the South took a grip on fourth place in the Championship with a narrow win over nearest rivals Falkirk. Derek Lyle pounced on a Will Vaulks' error to volley in the only goal after 22 minutes at Palmerston. With so much at stake, the match was strangely low key and Queens held on without too much fuss. Falkirk are now four points behind the Dumfries side, having played a game more, with matches against Rangers and Hibs to come. The Bairns must beat the teams second and third in the table and hope Queens come up short against the bottom three - Alloa Athletic, Dumbarton and Livingston. Given this win follows impressive successes against Hibs and Rangers, a late collapse for James Fowler's team appears unlikely. Blair Alston and John Baird threatened for Falkirk early on but Lyle netted with the home side's first glimpse of goal, seizing on Vaulks' poor back header to smash in a terrific strike. Alston headed wide as the visitors sought a response and home goalkeeper Alexander Clark parried shots from both Craig Sibbald and Luke Leahy in the second half. Match ends, Queen of the South 1, Falkirk 0. Second Half ends, Queen of the South 1, Falkirk 0. Attempt saved. Craig Sibbald (Falkirk) left footed shot from outside the box is saved in the bottom right corner. Substitution, Queen of the South. Iain Russell replaces Gavin Reilly. Hand ball by Tom Taiwo (Falkirk). Substitution, Falkirk. Alex Cooper replaces Blair Alston. Will Vaulks (Falkirk) wins a free kick in the defensive half. Foul by Gavin Reilly (Queen of the South). Luke Leahy (Falkirk) is shown the yellow card. Foul by Luke Leahy (Falkirk). Daniel Carmichael (Queen of the South) wins a free kick in the defensive half. Attempt saved. David Smith (Falkirk) right footed shot from outside the box is saved in the centre of the goal. Corner, Falkirk. Conceded by Zander Clark. Attempt saved. Kevin O'Hara (Falkirk) header from the centre of the box is saved in the bottom left corner. Attempt missed. Chris Higgins (Queen of the South) right footed shot from the centre of the box is close, but misses to the right. Corner, Queen of the South. Conceded by Will Vaulks. Attempt missed. Kevin O'Hara (Falkirk) left footed shot from the centre of the box is too high. Delay in match Luke Leahy (Falkirk) because of an injury. Substitution, Queen of the South. Mark Millar replaces Derek Lyle. Attempt saved. Luke Leahy (Falkirk) right footed shot from the left side of the box is saved in the centre of the goal. Substitution, Falkirk. Kevin O'Hara replaces Mark Kerr. Derek Lyle (Queen of the South) is shown the yellow card. Attempt missed. Derek Lyle (Queen of the South) right footed shot from outside the box misses to the left. Attempt saved. Craig Sibbald (Falkirk) left footed shot from more than 40 yards on the right wing is saved in the bottom right corner. Michael Paton (Queen of the South) is shown the yellow card. David Smith (Falkirk) wins a free kick in the defensive half. Foul by Michael Paton (Queen of the South). David Smith (Falkirk) wins a free kick in the attacking half. Foul by Kevin Holt (Queen of the South). Second Half begins Queen of the South 1, Falkirk 0. First Half ends, Queen of the South 1, Falkirk 0. Foul by Derek Lyle (Queen of the South). Luke Leahy (Falkirk) wins a free kick on the right wing. Michael Paton (Queen of the South) wins a free kick in the defensive half. Foul by Kieran Duffie (Falkirk). Mark Kerr (Falkirk) is shown the yellow card. Foul by Mark Kerr (Falkirk). Derek Lyle (Queen of the South) wins a free kick in the attacking half. Attempt saved. David Smith (Falkirk) left footed shot from outside the box is saved in the centre of the goal. Attempt missed. David Smith (Falkirk) right footed shot from the right side of the box is close, but misses the top left corner.